The Best Gas tankless water heaters can prove to be a smart investment for any home. Not only will they provide you with an instant flow of hot water, but in the long run they can prove to be very cost effective. Especially if you choose the right water heater for the size of your home. If you aren’t sure which is the best gas tankless water heater for your home, keep reading as this guide will give you tips and insights on what to look for. If you are interested in the best electric tankless water heaters for your home please visit our buying guide here. This guide will also break down safety issues you should be aware of as well as things you can do to properly maintain, and extend the life of, your gas tankless water heater. While gas tankless water heaters can provide you with unlimited hot water and long term savings, they can only do so if you have the right water heater for your home. With that being said here are 8 things you should consider when purchasing a gas tankless water heater. Knowing what size water heater you need is the first step to ensuring you and your family always have access to hot water. The size you need will depend on the size of your household. If you live in a two bedroom apartment you won’t need the same gallons per minute as someone who lives in a 5 bedroom home. If you only run one shower at a time in your home then there is no need to spend money on a unit that is designed to run several water driven appliances at the same time. The good news is most manufacturers have a free online calculator that makes it super easy for you to find the right size gas tankless water heater for your home. If you try to figure it out on your own you may end up with a unit that’s too small. Units that are too small may not be able to produce the amount of hot water you need which means you may find yourself running out of water. On the other hand, if you get a unit that’s too large you will end up wasting a ton of gas, money, or both. Figure out how many showers and sinks in your home will need hot water on a daily basis. You will then need to figure out their flow rate. Knowing this information will help you better determine the right size water heater for your home. What Type of Fuel Will It Use? A gas tankless water heater needs fuel to operate. And when it comes to fuel, the two most common options are natural gas and propane. The first thing you will probably think about is price. In this case, being that you are using a gas tankless water heater, natural gas will be the cheaper option. The cost of propane gas is measured by the gallon. Natural gas on the other hand is measured per cubic foot. Keep in mind the size of your home and where you choose to purchase your gas from will also play a role in how much you pay. The great thing about natural gas is it is delivered through a pipeline straight into your home. Propane gas on the other hand is sold in canisters and must be purchased either online or at your local home improvement store. What Type of Climate Will The Water Heater Be Used In? The type of climate you live in plays a huge role in determining what type of gas tankless water heater will be best for your home. If you live in an area that experiences extremely cold weather, the water heater will need to use more energy to heat the water. The altitude of your home will also come into play when looking into tankless water heaters. 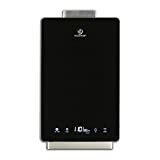 If you live in colder climates you will need a gas tankless water heater that is very powerful. Otherwise you may find yourself taking showers in lukewarm water. What Are The Requirements For Installation? When it comes to installation the biggest concern you will face is cost. Depending on how things are already set up, you could easily find yourself spending thousands on installation alone. Even if you already have a gas line setup, there is a good chance a few modifications will be needed based on how you plan to position the unit. Other than cost, you will also need to consider how difficult installation may be. For best results it is always best to leave installation to the professionals. Trying to install a gas tankless water heater on your own can prove to be a very expensive mistake. Especially if you have no experience or knowledge doing this type of work. The last thing you want to do is compromise the safety or functionality of the unit. So please, leave the installation to the pros. What Safety Features Are Included? When you are dealing with a gas tankless water heater, safety is one of the most important things that should be on your mind. It is so important that we have dedicated an entire section to showing you how to stay safe when operating this type of water heater. You will be able to find that information later on in this guide. As far as safety goes, you need to look for any certifications and quality control tests that show the unit is safe to operate. Two key safety features you want your water heater to have are flame failure protection and combustion technology. Check the quality of the components as you want them to be of the highest possible quality. Cheap components can lead to the unit malfunctioning and that can potentially lead to a dangerous situation. If you live in an area with extremely cold weather look for a safety feature that keeps the unit from freezing. What Technical Specifications Do You Need? The technical specifications are just as important as the safety features. This is because the technical details are what determine how the unit will perform. With that being said, here are 4 important technical specifications you should look for when searching for a gas tankless water heater. Gallons Per Minute – Gallons Per Minute, often shown as GPM, is what determines the capacity of the water heater. The smaller the household the fewer gallons per minute you will need. Generally speaking 4 gallons per minute will be plenty for a small household. If you have a large home you should opt for a unit that provides a minimum of 7 gallons per minute. Low Nox – Low Nox means the unit produces low emissions and will therefore not harm the environment. Low Nox gas tankless water heaters are equipped with a special vent pipe that pushes combustion gases into the inner vent. Whenever possible, opt for a unit that is labeled Low Nox. Energy Factor – In technical terms the energy factor is the amount of hot water the water heater produces per unit of fuel on a daily basis. The higher the energy factor rating the more efficient the unit will be. This basically means the unit will use less gas to heat the water in your home. When less gas is used you ultimately save more money. British Thermal Unit – The British Thermal Unit (BTU) is the amount of gas needed to heat the water in the tank for an hour. A high BTU means the unit has a very powerful heating ability. How Is The Unit Constructed? The way the unit is constructed is the best indicator of quality and durability. You want a unit that has been constructed using only the highest quality materials. The materials should be tested and proven to be able to withstand the test of time. All components of the unit should be of superior quality. The materials used to construct the unit have as much to do with durability as they do with safety. Units constructed using quality materials are less likely to be prone to fires and a host of other safety issues. A good warranty will give you peace of mind knowing that you will be covered if something should happen to your gas tankless water heater. Generally speaking this type of water heater will come with a one year warranty. However, you should look for models that offer longer lasting warranties. If at all possible get a unit that has a lifetime warranty. If that isn’t possible go for one that has a 10 or 15 year warranty. Each manufacturer is different and will offer different length warranties and different coverages. While the heater may be covered for an extended period of time, the other components will usually be covered for only a few months. Make sure you read and fully understand the terms of the warranty before purchasing the unit. Check PriceThe Takagi T-KJr2-IN-NG Indoor Tankless Water Heater has a 140,000 BTU rating and is equipped to heat the water in your home at a maximum flow rate of 6.6 gallons per minute(GPM). In order to continuously monitor the water temperature the unit features thermistors on both the inlet and outlet of the system. The unit is energy star certified and has an energy factor of 0.81-0.83. 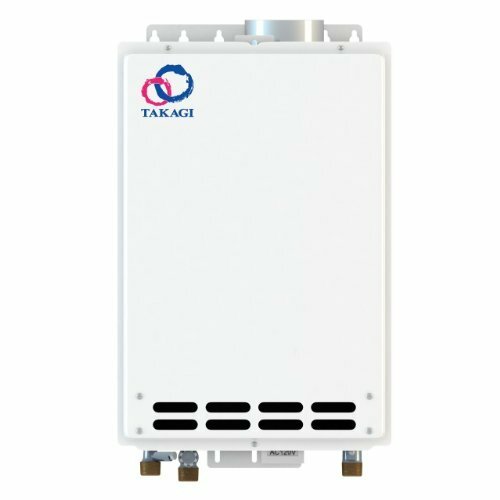 The Takagi T-KJr2-IN-NG Indoor Tankless Water Heater is designed specifically for residential spaces. Once you install it you will never have to worry about running out of hot water again. The unit comes with a 10 year warranty on the heat exchanger and a 5 year warranty on other parts of the unit. While this unit is specifically designed for residential use, it can be installed in commercial spaces. For commercial installations the warranty on the heat exchanger is only 5 years and the warranty on other parts is 3 years. Please note you will need a 4-inch category III Stainless Steel vent to properly install this unit. When it comes to energy efficiency the Rinnai V65IN 6.6 GPM Indoor Low NOx Tankless Natural Gas Water Heater is in a league of its own. Not only is it Energy Star certified, but it also has a .82 energy factor rating. This basically means the unit will heat your water while using the minimal amount of natural gas. When it comes to features there are several things that are worth mentioning. Let’s start with the temperature lock. This feature is what ensures the temperature of the water remains consistent by preventing unauthorized or accidental changes from taking place. The enhanced scale detection feature prolongs the life of the unit by decreasing the possibility for serious, long term damage. There is also a mechanism that protects the unit from frost and prevents it from freezing. Which by the way is extremely important for those who live in areas known for extremely cold winters. The interesting thing about the Rinnai V65IN 6.6 GPM Indoor Low NOx Tankless Natural Gas Water Heater is that is has been certified for installation in manufactured homes. That is not something you usually see with this type of water heater. If you have any problems with this unit troubleshooting it is a lot easier than you might think. Thanks to the error code indicator you will be able to quickly diagnose the problem and figure out the best way to fix it. Last but not least, this unit comes with a 10 year warranty on the heat exchanger, a five year warranty on parts and a one year warranty on labor. When it comes to the warranty, make sure you read and understand all the terms and conditions to ensure you remain eligible for the warranty. The response is slow. Some users have complained about it taking 30 seconds before the water starts to heat up. 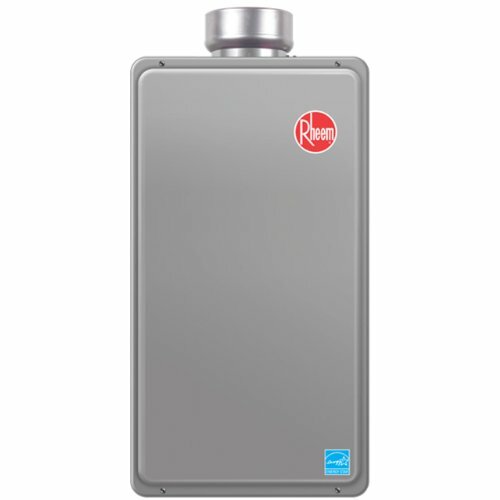 If you are looking for the perfect solution for heating the water in your home then look no further than the Rheem RTG-64DVLN Prestige Low NOx Indoor Direct Vent Condensing Tankless Natural Gas Water Heater. With the Rheem RTG-64DVLN Prestige Low NOx running out of hot water will quickly become a thing of the past. This energy efficient unit will provide your family with a continuous flow of hot water without taking up a ton of space. It features a self diagnostic system that makes installing and servicing the unit a hassle free process. The Rheem RTG-64DVLN is perfect for 1 to 2 bedroom homes. You may have to rerun the gas lines in your home in order for the unit to work. This unit is a bit pricey and will cost you close to $800. If you want a unique water heater that is unlike anything else on the market, the Eccotemp i12-NG Indoor tankless heater is exactly what you need. With its new revolutionary design and black acrylic glass casing, this water heater has the perfect modern look that will look great in any home. The fully automatic temperature controls allow you to control the temperature with great precision. The touch screen and LCD temperature display allow you to easily monitor the GPM flow and output temperature. The Eccotemp i12-NG runs on natural gas and has an impressive 3 GPM rating. Its indoor i12-NG design makes it ideal for situations where you need small to medium hot water production for multiple applications at the same time. The Eccotemp i12-NG Indoor tankless heater can be installed in small homes, cottages and vacation homes. It comes with a horizontal stainless steel vent kit making it ready to install right out the box. It also comes with a 120 Volt UL listed power cord to power the internal exhaust fan and a digital display. When idol the Eccotemp i12-NG pulls only 2 watts, and during operation it uses 1.07 amps. This makes it one of the more efficient gas tankless water heaters on the market. Must drain and disconnect the unit if the temperature falls below freezing. Always remember you are dealing with a tankless water heater that uses gas. That means you need to be very careful when operating the unit. If you are careless you may find yourself dealing with a very scary situation. The most common one being some sort of explosion of the heater. If the unit should explode or burst, this could lead to a fire breaking out and that could put you and your family at risk. To prevent this type of thing from happening there are a few very important things you should do. Setting the right temperature on the water heater is the first step to staying safe. To set the right temperature you must first know the maximum heat settings which can be found in the manual. If you set the temperature too high you will increase the likelihood of a fire breaking out. Water that is too hot can also lead to burns and scalding. Again, this type of water heater is powered by gas. That means anything that is flammable can easily catch fire. While it is best to avoid using anything flammable near the water, we understand that’s not always possible. If you must use something that is flammable in the vicinity of the water heater make sure you take all necessary precautions. Always install the unit based on the manufacturer’s instructions. If at all possible, its best to hire a professionally trained technician to come to your home and install the unit. Having a professional install the unit will decrease the risks associated with using the water heater. Having the unit inspected once or twice a year is the best way to spot problems before they turn into something more serious. Hard water can damage your gas tankless water heater so it would be a good option to buy a water softener. This way your water heater will last longer. Anytime you need repairs hire a licensed technician to deal with them. This way you know they will be properly dealt with and you are less likely to have the same problem again. To ensure your gas tankless water heater operates safely and always performs at peak levels, it is your responsibility to maintain it as best you can. The good news is properly maintaining your water heater will require very little effort on your part. But the effort you do put in will make a huge difference in how the unit performs over the course of its lifespan. Some of these tips will be very similar to what we have already shared in the previous section. For example, inspecting the unit on a regular basis helps with both safety and maintenance. Anytime you notice any damage or dents, view that as a sign that there might be a problem you need have checked out. You should also listen for weird sounds as they too are an indication that something may be wrong with the water heater. Over time it is very likely sediment will start to build up in the water heater. This is a result of the hard water that has been flowing through the unit. Whenever sediment builds up in a water heater it can dramatically impact how the unit functions. The biggest impact is on its ability to heat the water coming into your home. To prevent sediment from building up in your gas tankless water heater you will need to flush it at least once a year. For best results do it two to three times per year. Sep 1 – Always remember that safety comes first. Before you do any work on the unit make sure the gas is completely shut off. To do this rotate the gas cutoff counterclockwise and make sure the unit is turned off. Step 2 – Turn off the lever to stop the water from flowing into the heater. Step 3 – Remove the heater cover. Some units will have screws that need to be removed first. Step 4 – Find the water inlet and connect a hose to the end of it. The other end of the hose should be connected to a submersible pump. Once you have the hose connected place the submersible pump in a bucket that can hold at least five gallons of water. Step 5 – You will need a second hose to complete this step. Take the second hose and connect it to the service port for hot water. The other end of the hose should be placed in the bucket. Step 6 – Take one gallon of undiluted, virgin white vinegar and pour it into the bucket. Be sure not to add too much into the bucket. Step 7 – This is where all the action will take place. Open both the hot and cold water ports and then turn on the pump. Once the pump is turned on the white vinegar will start to circulate through the unit and get rid of all the sediments that have built up. Let the pump run for about 45 minutes before turning it off. Step 8 – Turn off the pump and start draining the vinegar. Step 9 – Remove the screen filter and inspect it. Depending on its condition you can either have it cleaned or replace it. Once you have dealt with the screen filter make sure you return it to its original position. Step 10 – The tenth and final step is the remove the hose and place the cover back on the water heater. Turn the water supply back on and then turn the gas back on. Now that all the sediments have been removed you water heater should be good to go. Now that you’ve read through our brief buying guide we hope you will find it easier to decide which gas tankless water heater would work best for your home. While all four units we reviewed are great in their own way, it is up to you to do more research to find the one that will meet your personal needs and preferences. 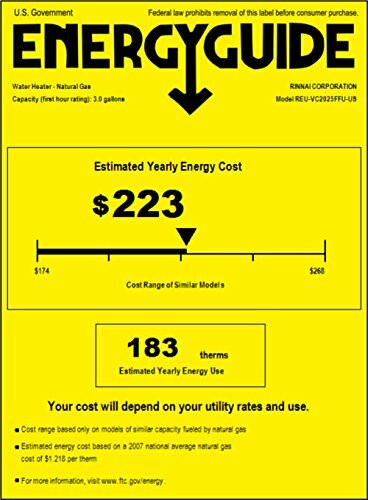 While Rheem models tend to have higher price tags, the Rheem RTG-64DVLN Prestige Low NOx Indoor Direct Vent Condensing Tankless Natural Gas Water Heater will cost you just under $750, they are also some of the best units for larger homes due to their large heating capacity. They are also very durable and loaded with features that will keep you and your family safe. If you are looking for something that is a little more budget friendly, the Eccotemp i12-NG Indoor tankless heater, 1/2 inch NPT water fittings would be the best way to go. It will cost you less than $300 and features a hot water capacity range between 0.6 – 4.8 gallons per minute. The Eccotemp i12-NG Indoor tankless heater, 1/2 inch NPT water fittings is ideal for homes that have small to medium hot water production needs. 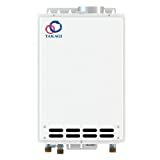 The Rinnai V65IN 6.6 GPM Indoor Low NOx Tankless Natural Gas Water Heater and the Takagi T-KJr2-IN-NG Indoor Tankless Water Heater, Natural Gas are both great options for average sized homes. Always remember not all gas tankless water heaters are created equal. While some of them may offer the same features, that doesn’t mean they are the best option for your home. Try to avoid using price as the ultimate determining factor of which unit you decide purchase. While price is indeed important, it is not the most important thing. The most important thing is making sure you invest in a unit that can provide you with the right amount of hot water production for you home. The last thing you want to do is invest in the cheapest possible unit, have it installed, and then find out it doesn’t provide you with enough hot water for all the applications in your home. You also want to make sure the unit you purchase is made using quality materials. This way the unit is less likely to break down and give you problems. Even if you are on a budget, with so many great options available you won’t have to sacrifice quality in order to save money. Just make sure you take your time and do plenty of research. Read through the reviews we shared and pick the one that fits your budget as well as your hot water production needs.